In this guide, I would like to explain JDBC Best Practices. We can follow these best practices in the day to day project work. 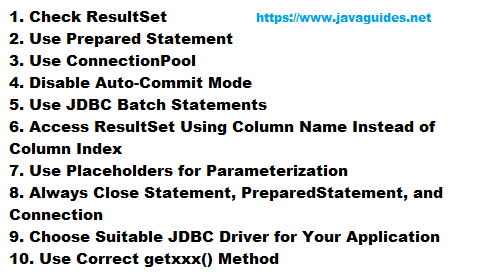 Check out JDBC complete tutorial at https://www.javaguides.net/p/jdbc-tutorial.html. As I know, we basically prefer ORM framework to develop DAO layer like Hibernate ORM Framework but If you still using JDBC in your projects or if you are learning about JDBC then this post will guide you the best practices of JDBC. Always check the return values of navigation methods (next, previous, first, last) of a ResultSet. If the value return is ‘false’, it should be handled properly. Prepared Statement is used for executing a precompiled SQL statement. java.sql.PreparedStatement is suitable for executing DML commands: SELECT, INSERT, UPDATE and DELETE. 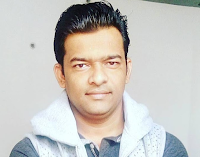 Prepared Statement is faster as compared to Statement because it is used for executing pre-compiled SQL statements. Hence, the same SQL query can be executed repeatedly in Prepared Statement which improves the performance. PreparedStatement allows you to write a dynamic and parametric query. PreparedStatement prevents SQL Injection attacks in Java. JDBC Statement Interface - In this article, we will learn commonly used methods of Statement interface with examples. JDBC PreparedStatement Interface - In this article, we will learn commonly used methods of PreparedStatement interface. It’s recommended to run SQL query with auto-commit mode disable. The reason behind this JDBC best practice is that with auto-commit mode disabled we can group SQL Statement in one transaction, while in the case of auto-commit mode enabled every SQL statement runs on its own transaction and committed as soon as it finishes. So, always execute SQL queries with auto-commit mode disabled. For example: In JDBC API, the Connection interface provides the setAutoCommit() , commit() and rollback() methods to perform transaction management. Learn how to use JDBC transactions with examples at JDBC Transactions with Example. This is another JDBC best practice which is very popular among developers. JDBC API provides addBatch() method to add SQL queries into a batch and executeBatch() to send batch queries for execution. The reason behind this JDBC best practices is that JDBC batch update potentially reduces the number of database roundtrip which again results in significant performance gain. So always use JDBC batch update for insertion and update queries. In simple words, Batch statement sends multiple requests from Java to the database in just one call. Without Batch statements, multiple requests will be sent in multiple (one by one) calls to the database. Example to update records in a batch process using Statement and PreparedStatement interfaces. Example to insert records in a batch process using Statement and PreparedStatement interfaces. Example to insert records in a batch process via Statement interface. Example to update records in a batch process via Statement interface. Example to insert records in a batch process via PreparedStatement interface. Example to update records in a batch process via PreparedStatement interface. JDBC API allows accessing data returned by a SELECT query using ResultSet, which can further be accessed using either column name or column index. This JDBC best practice suggests using column name over column index in order to avoid InvalidColumnIndexException which comes if the index of the column is incorrect, most common of them is 0, since ResultSet column Index starts from 1, zero is invalid. In JDBC best practices, I would like to suggest using PreparedStatement in Java because of better performance. But performance can only be improved if the developer use bind variables denoted by ? or placeholders which allow the database to run the same query with a different parameter. Its common Java coding practice to close any resource in finally block or Java 7 try-with-resources as soon as you are done with that. JDBC Connection and other JDBC classes are a costly resource and should be closed in finally block or Java 7 try-with-resources to ensure the release of connection even in case of any SQLException. There are 4 types of JDBC driver in Java and it can directly affect the performance of the DAO layer. always use latest JDBC Driver if available and prefer type 4 native JDBC Driver. Read more about JDBC Drivers at Java JDBC API Overview. This is the last JDBC best practice in this article which suggests using correct getter while getting data from ResultSet to avoid data conversion even though JDBC allows to get any data type using getString() or getObject(). I hope these few JDBC best practices useful. Happy Coding !!! !.